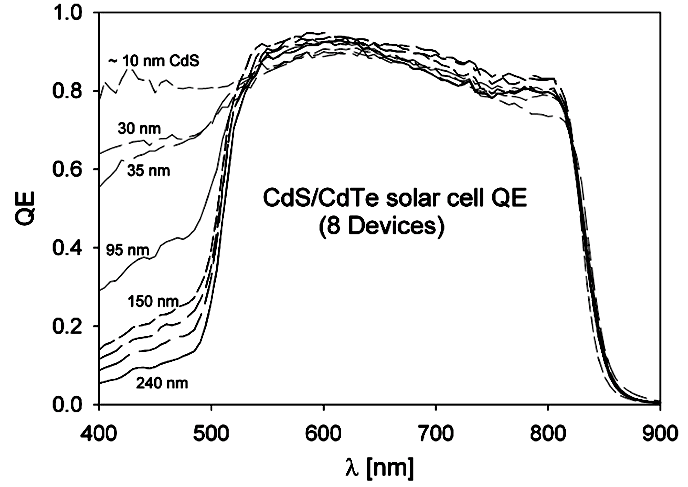 CdTe and CIGS are the two new kids on the block for thin-film solar. Both technologies promise rock-bottom manufacturing prices, and respectable efficiencies (10% or greater). First Solar’s CdTe modules have given them a $10Bn market cap and pole position in the industry, while a number of high-flying CIGS and CdTe startups chase them. First Solar may have all the manufacturing scale, but there is still a measure on which these technologies are still competing very closely: efficiency. Higher efficiencies are huge because the same amount of glass & aluminum provides more power – and since modules are priced based on their power, that extra money goes straight to the bottom line of the manufacturer. To understand what will determine efficiency, we have to dive into physics for a moment. I’ll keep it quick. Photons from the sun come in a wide range of wavelengths – this is what gives us the color spectrum. 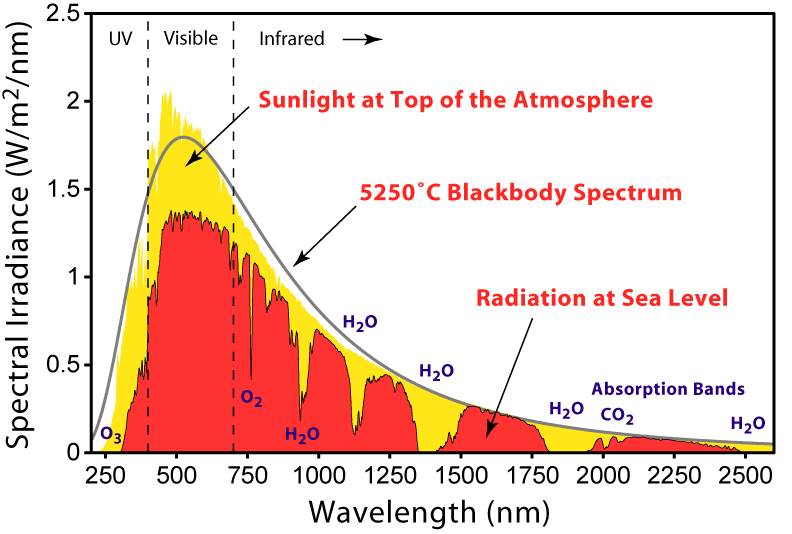 So the solar cells are tasked with absorbing that spectrum of light. Ideally, they would absorb the entire spectrum – but in reality, there are a host of constraints (e.g. shading, reflection, and recombination) that reduce the amount that a cell can absorb. You might be asking what “10% efficiency” means. It’s actually way simpler than you think. “Full sunlight” (noon on a summer day), means that a square meter of earth at sea level is hit with 1,000 watts of energy. A nice round number. So to put it mathematically, a full sun is equal to 1kW / m^2. Efficiency is therefore a measure of the amount of sunlight that a module can absorb at full sun. A 10% efficient module that is exactly 1 square meter large would generate 100W in full sun (1,000W x 0.10). Using real numbers: a First Solar module is 1.2m x 0.6m (0.72 square meters). If it generates 80 watts at peak power, that module is 11.1% efficient (80W/(0.72 square meters*1000)). 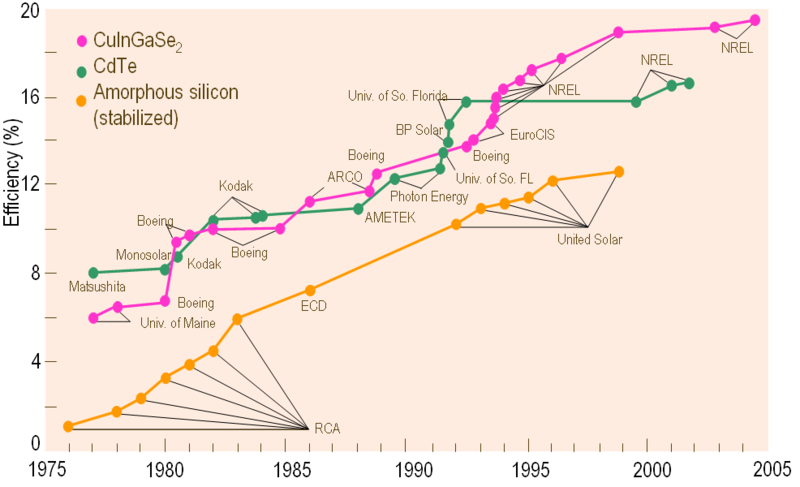 The efficiency race between these two technologies has been close for decades (see the chart below). Both have a theoretically maximum efficiency of about 30%. CIGS advocates brag that CIGS has the highest lab efficiency (19.9% efficient). However, it was done using an intensely complex process: quadruple sublimation (essentially, evaporating four different components at the same time, at very precise levels). This process was so complex, in fact, that no company is seriously trying to commercialize it. CdTe has a lower champion cell, but it is much simpler to manufacture. Its bandgap (1.4 eV) is almost perfectly tuned to capture the most sun with the least material. Pretty close, huh? That’s why it’s still an open debate. Physicists tend to predict that CIGS will eventually win – the lab efficiency is so much higher! But manufacturers have a healthy respect for the simplicity of CdTe; First Solar may keep the thin-film efficiency crown for years to come, through their manufacturing prowess. And only time will tell. 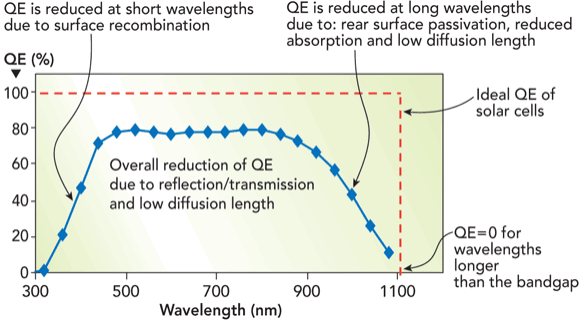 One last caveat on cell efficiency: don’t mistake cell efficiency for module efficiency. Module efficiency is always lower – often by 10-20%. (An analogy: cell efficiency is sort of like highway MPG, whereas module would be city MPG.) There are a bunch of reasons for this difference: resistance in the module, mismatch across cells, or shading from the front electrodes. Cell efficiency is still important – but module efficiency is what you’ll actually get in the real world.